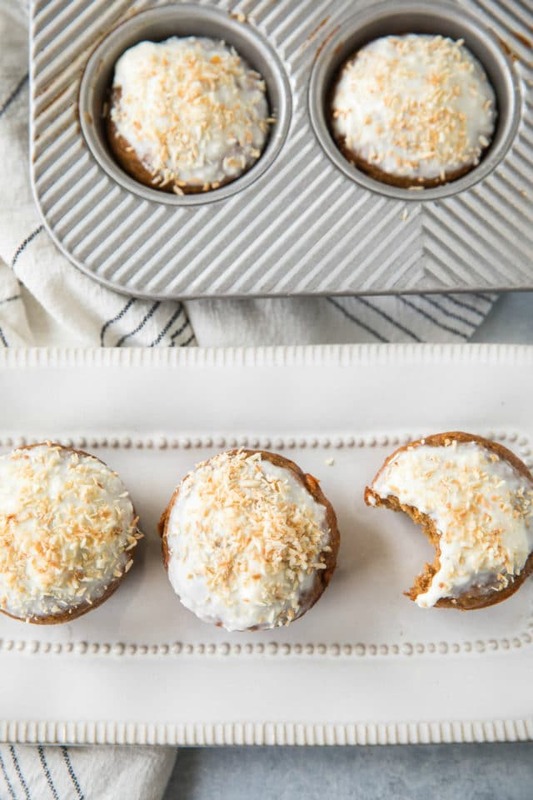 Flourless carrot cake banana muffins that are so tender and flavorful, you’d never know they were made without flour, oil, or refined sugar. Gluten free and made with wholesome ingredients, they make a healthy and delicious breakfast or snack. 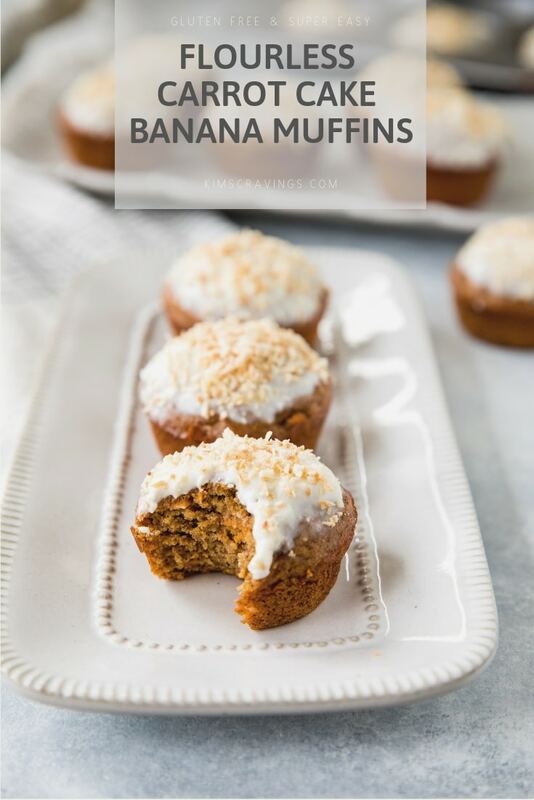 I have been SO excited to share these delicious muffins with you guys!! Healthy muffins! That taste like carrot cake! Oh, I think this might just be a dream come true. Truth be told, carrot cake gets me every single time. I just can’t get over the spices, flavor, and that thick-n-creamy cream cheese frosting that pairs so wonderfully with the cake. I’m not sure it gets better. These are so light and fluffy with the most tender little crumb, that you’d really never guess they were made without flour. Or oil. Or refined sugar. 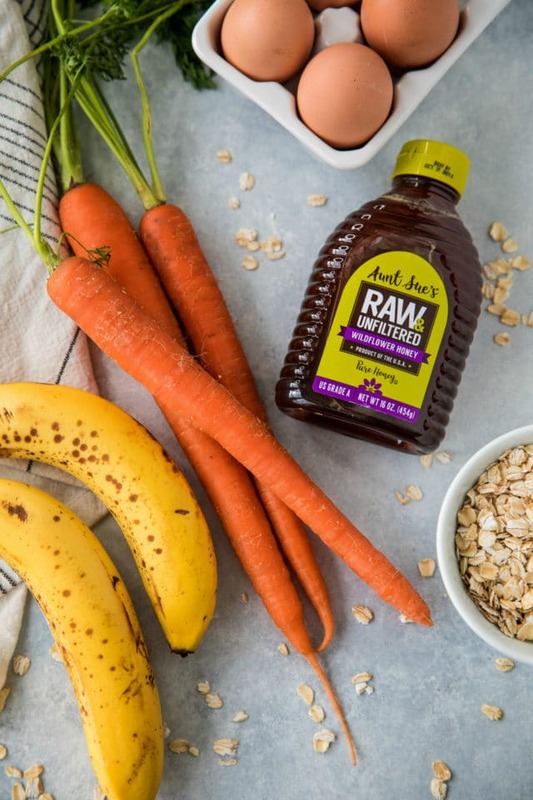 Pair that with the fact that they’re loaded with wholesome ingredients like oats, almond butter, eggs, flax, Aunt Sue’s Raw & Unfiltered Honey, bananas, and carrots, and you’ve got yourself a healthy breakfast or snack that doesn’t taste healthy at all. I absolutely LOVE baked goods made with honey. And honey really adds something special to the flavor and texture. I especially LOVE using honey from the Sioux Honey Association Co-op. There’s just no beating Sioux Honey! It’s super awesome that Sioux Honey is a co-op, not a corporation, so they’re able to keep their focus on what’s best for their beekeepers, their honey and their customers. In fact, the beekeepers are the operators of the co-op and they are the ones making the decisions to do what’s best for the honey and the families who buy their honey. It makes me feel good to know I’m feeding my family a product I can trust to be of the highest quality. The exact reason why my honey comes from Sioux Honey Association Co-op. You can find their products in most major grocery stores or they are available online at www.siouxhoney.com. You can also learn more and watch the short story behind Sioux Honey products on the site. Okay! So let’s talk about the art of making flourless muffins since it’s not exactly the same as whipping up a batch of traditional ones. First off, these are made in a blender. Not baked in one, but the batter itself is mixed in one. This works best because you want the oats to be ground into a flour consistency. Alternatively, you could skip the blending process and use pre-ground oat flour. This way you can mix everything by hand in a mixing bowl. It’s not a 1:1 swap, but I let you know how much you’ll need to use in the recipe below. And, as always, make sure to use gluten-free oats or oat flour if you need these to be 100% gluten-free, since oats can be made on the same equipment as wheat products, despite being naturally gluten-free themselves. The batter itself should be slightly on the thicker side – enough so that you have to spoon it into the muffin cavities. And for those, I recommend either greasing your muffin pan well or using parchment paper liners since the lack of flour and oil could cause these muffins to stick to regular paper liners. And for these particular muffins, I also recommend transferring the batter to a large mixing bowl when it’s time to stir in the carrots. I know it’s an extra step and an extra bowl to clean, but I’ve found that it’s a little tight in the blender bowl and difficult to distribute the carrots properly. But if you can make it work, then by all means! Evenly spoon the batter into 12 muffin cavities and back for about 20 minutes. Once your muffins are baked, out of the oven and then completely cool, you can make the cream cheese glaze. It is totally optional, but so delicious. I obviously didn’t include the cream cheese glaze as healthy, but there is really very little on top of each muffin. These muffins are so simple! What sets them apart from the rest is the perfect blend of spices, and a few secret ingredients to make these healthy muffins taste sinful. Unlike standard muffins made with refined all-purpose flour, these are made with oats or oat flour. That means they’re made entirely with whole grains and easily gluten-free. Because of the flour choice, these muffins will be a little denser and not as tall as a typical muffin. But these gluten-free muffins are moist and beautifully fluffy. Bananas along with almond butter replace any oil or butter needed. They both act to keep these muffins moist and dairy free. 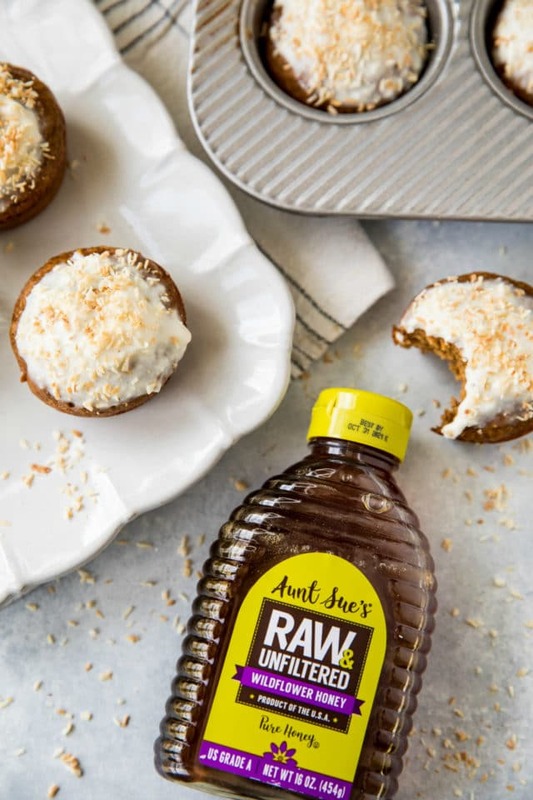 Aunt Sue’s Raw & Unfiltered Honey replaces refined sugar, so these muffins are naturally sweetened. 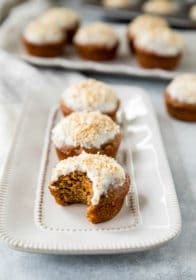 WHAT ELSE CAN I PUT IN MY CARROT CAKE MUFFINS? I kept these nice and basic, but feel free to add some fun mix-ins! Try dried fruits like raisins, cranberries, chopped apricot or chopped dates. You can also use nuts! 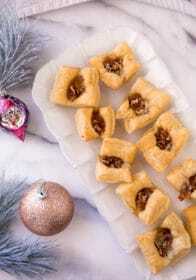 I love to use soft varieties like pecans and walnuts. Do you have a major sweet tooth? Try out some chocolate chips. Insert a toothpick into the thickest part of one of the muffins in the tin. If the toothpick comes out clean, your muffins are done baking. If there is any batter sticking to the toothpick, bake for another 3-5 minutes at a time until the toothpick comes out clean. Use a new toothpick for each test. Store these muffins in either a plastic bag, plastic wrap, or an airtight container. They will last at room temperature for 3 days or in your fridge for 1 week. These are extra delicious if you reheat them for about 30 seconds in the microwave before digging in! Wrap these muffins individually with either plastic wrap or foil, or you can place them all in a large freezer bag or airtight container. Freeze for up to 3 months. Reheat by putting them in the microwave for 1 minute, or until heated through. Preheat your to 350°F (176°C) and prepare a muffin pan by lining the cavities with parchment paper liners or greasing them well with oil. Set aside. Add all of the remaining ingredients except for the carrots, and process on high until the batter becomes smooth and creamy, about 30 seconds. Periodically stop and scrape down the sides of your blender, if necessary. Transfer the batter to a medium-size mixing bowl (this makes it easier to mix in the carrots), and fold in the carrots by hand. Bake for 18 - 20 minutes, until the tops of your muffins begin to turn golden brown and a toothpick inserted into the center comes out clean. Allow the muffins to cool in the pan for 10 minutes before transferring them to a wire rack to cool completely. Once muffins have completely cooled, make the cream cheese glaze. Place cream cheese in medium microwave safe bowl and microwave on high for 30-45 seconds or until cream cheese is somewhat warm and a little runny. 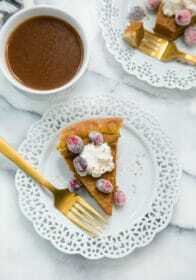 Stir in powdered sugar, vanilla extract and 1-2 tablespoons of milk. Continue to stir until glaze reaches desired consistency; not too runny and not overly thick. Dip each muffin top into cream cheese glaze then place back on wire rack. Sprinkle with coconut flakes if desired. These muffins can be stored in an airtight container at room temperature for up to 3 days, in the fridge for up to a week, or frozen for up to 3 months. *Alternatively, you can replace the oats with 1 cup + 1 tbsp (121 g) of oat flour and mix by hand. **You will not use all of the cream cheese glaze and there is actually very little on each muffin, so it is not calculated in the nutritional information. These muffins are really amazing! Taste so good! Now these sound like my sort of muffins, such delicious flavours. I love that these are both gluten-free and refined sugar-free! I bet my kids would love them…that is if I let them have any…LOL 😉 So decadent and healthy at the same time! These muffins look and sound delicious. 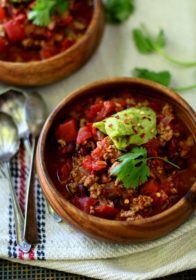 I love the spices in there and the fact that they are gluten free makes them perfect for everyone! You were exactly right, you can’t even tell that there is not flour in this recipe! Lovely, will be making again! 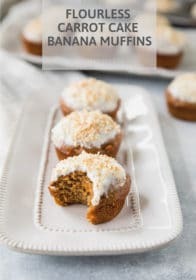 These Banana Muffins look soft moist and delicious. They are cute as a party option too. These muffins look great! 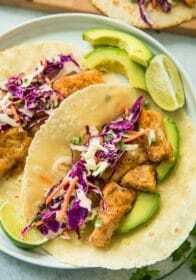 I love the ingredient combo you have used and I sure bet my kids would love these! I can’t wait to try this recipe out. 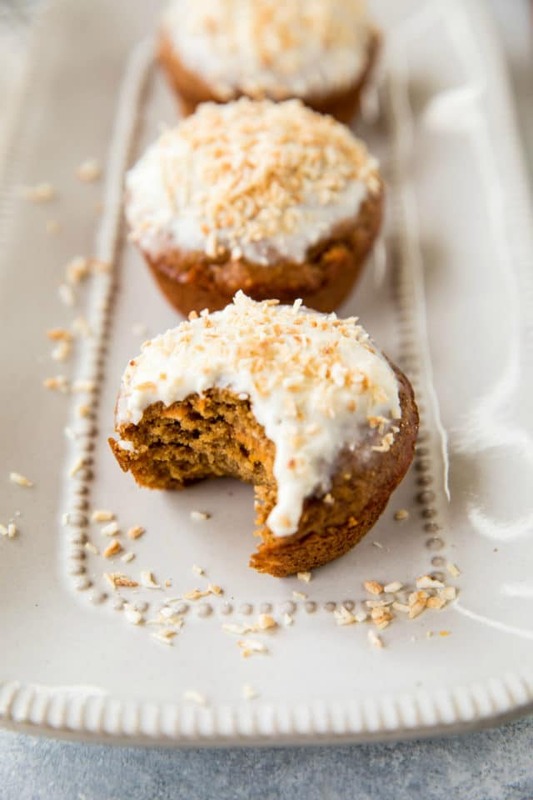 Carrot cake is one of my favourites, so I am definitely going to give this a try. I’ve never heard of Sioux Honey Association Co-op before, but now I’m very curious. Thanks for the tip. Your recipe looks great; however, I’m scratching my head about the Nutrition Facts re: fat. So, if there’s 7+ grams per muffin then what type of fat is it? OK, disclaimer, I’m a registered dietitian and would like all the picky details. ha ha. Thanks! Thanks! It’s probably the almond butter and eggs. I just double checked it again with myfitnesspal.com. Hope you get a chance to make them – they’re a favorite of mine! Thanks for sharing! 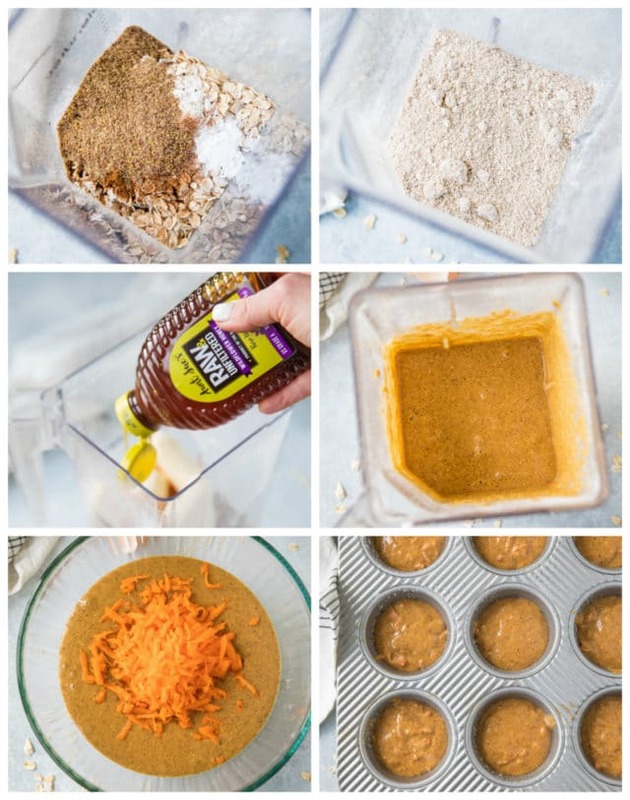 Do you use this base for any other muffins? Do you happen to have an egg replacement suggestion ie. flax, chia banana or a egg substitute brand? Or will this only work with egg? 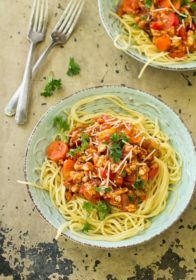 Would love to try this recipe! So so clean! I really think this would work just fine with a flax egg, especially since it has the banana in it too. I haven’t personally tried this, though. Let us know if you do and how it works!